Heat the olive oil in large skillet over medium-high heat. Once hot, add bacon to skillet and brown. Remove bacon and place on paper towel. When cool, crumble for later use. Drain excess bacon grease, leaving about two tablespoons plus any crispy bacon bits in the pan. Add the shallots and garlic to the pan. Cook 3 to 4 minutes then deglaze the pan with vinegar. Turn spinach in the pan and wilt down a bit. Don’t fully cook the spinach, just give it a few turns with tongs. Season the greens with salt, pepper and nutmeg. 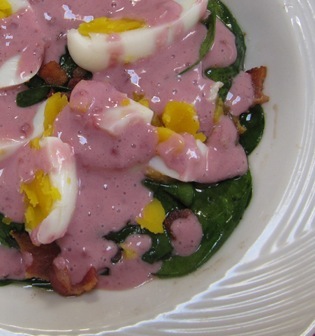 Place spinach on a serving dish and top with quartered eggs, shavings of cheese and reserved crumbled bacon. Top with Duke’s creamy raspberry dressing. Whisk together the ingredients for a dressing that lasts at least one month in the refrigerator.